One of the strongest pillars of the Dreamcast's software library is arguably its fighters. From the pure SNK goodness of Garou: Mark of the Wolves and The Last Blade series, through to the 3D extravaganzas of Virtua Fighter, Dead or Alive 2 and SoulCalibur, there is no doubt about it that Sega’s last home console was, and still is, home to some of the best fighting games ever made. The thing is though, the official Dreamcast controller just doesn't cut it if you want any degree of fine control with these titles. That’s not to just pick on the Dreamcast of course, most consoles’ default gamepads are equally woeful - maybe apart from the Neo Geo AES, whose whole reason for existence was to emulate the arcade - however it does mean that if you want to really get the most out of the system’s library then you need to invest in a decent arcade stick. Pulling off specials and supers becomes so much easier with an arcade stick. As was typical for Sega’s last role of the dice, the Official Arcade Stick for the system - for a brief introduction check out GagaMan’s rundown of the hardware over at www.dcgaga.com - was robust, affordable and fitted with the exact type of microswitched joystick that really unlocks the precision and fluidity required to master any proper fighting game. It wasn’t perfect of course, with its square stick restrictor gate, non-microswitched buttons and garish green colour scheme taking a little of the sheen off the final product, but all things said it was a tidy piece of kit. Today the Official Arcade Stick is still a tidy piece of kit, however its price has increased dramatically, with new units selling for north of £100 on eBay (it was sold for £34.99 new when released). There are nice alternatives to the official stick, such as the good Ascii Stick FT, however asides from that unit, which is now notoriously rare, things swiftly get bargain basement. SoulCalibur's weapon-based combat is still as refreshing today as it was when first released. So, what to do? The answer is to pick up the Official Arcade Stick second hand as cheap as you can and then mod it with some of the best arcade hardware currently available. This not only allows you to iron out those old failings, but also allows you a nice degree of customisation, allowing you stamp your own mark on the peripheral. I did this myself last year and, as you can see, things turned out pretty darn good. Garish green stick and buttons begone! The case now features a microswitched Sanwa joystick with octagonal restrictor gate and Seimitsu bubble top handle, as well as six Sanwa microswitched arcade buttons. Overall the build took just over a day to complete, with only a little internal case modification and cabling necessary. Of course, I simply did a component replacement, however if you wished to get more creative, the case and its internal layout is very solid and spacious, allowing for all sorts of additional tweaks. I won’t go into detail of the job here, as there are quite a few excellent step-by-step guides on the Internet already - this one is particularly useful - however I will suggest you give it a go if you can as the finished product is definitely worth it. 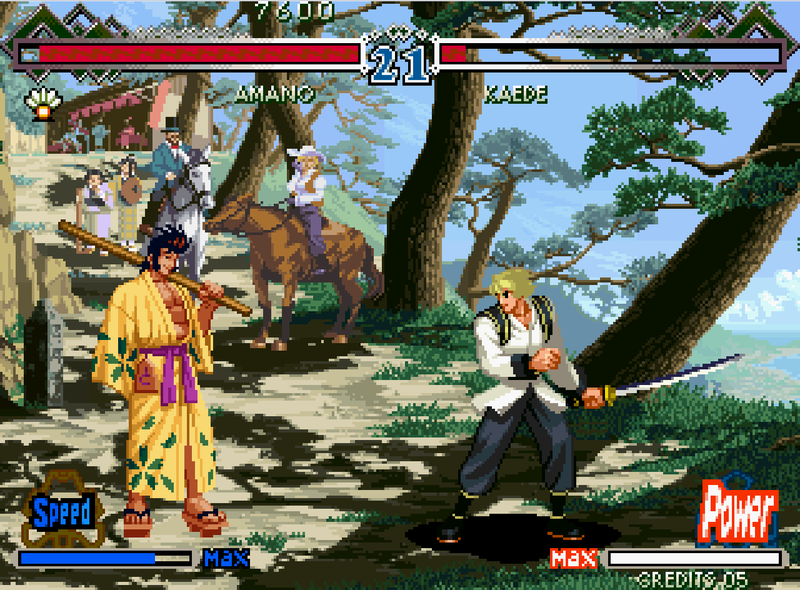 The Last Blade series has some of the best looking background and character art of any fighter ever. Indeed, my experience with the project just seemed to reaffirm the legacy of the Dreamcast as being a very versatile and open platform on which to play games. From the still thriving indie scene, through the ease of system modification (region free bios, VGA, SD card slot, etc) and onto the broad range of accessories released, it is testament to Sega that even today, over 15 years since the Dreamcast’s release, extra quality and enjoyment can be squeezed out of its hardware with little effort. Sega as a hardware producer may be gone, but it sure did go down fighting. The official arcade stick is AWESOME. Mine has been rocking like 12 years on a weekly basis and it is still fully functional. Definitely is the way to go if you are into DC shooters/fighters. By the way, I recently started using it on my PC via an adapter called Retro Linker Plus II and I fully recommend it. Works like a charm with no lag. It has basically rendered superfluous many other PC/PS3 stick. Fascinating post - and a really impressive cutom job on the fight stick! I've never actually tried a Dreamcast arcade stick so I'd be interested to know how it improves the experience whe playing fighting games. For shmups and fighters an arcade stick is a major advantage. In fighters especially I always struggled to execute the more complex moves and combos until I picked one up. Now I still get whupped, but at least I do it in style. I managed to get two of the official arcade sticks, one around the time the Dreamcast was on store shelf's and another a few years later. Possibly one of my favorite controllers of all time, even without mods. The Dreamcast is still my go-to for most fighting games, unfortunately I only have one arcade stick. My senior year of high school, for some reason, we were taking our math final in a computer lab. This was before cell phones had proper internet, but between problems I decided to browse eBay. There was an auction for a like-new official arcade stick ending before my class period was up. At the time I probably should have focused more on my exam, but I instead I watched the auction. At the last moment I bid and won! $33 including shipping! I can't remember but I'm pretty sure I failed my exam. Totally worth it. I've modded 2 Dreamcast Arcade sticks with sanwa parts to work with my NAOMI 2 set up. You can usually get a *JUNK* one for pretty cheap on ebay/YAJ and it's super easy to fix up.